It’s time for the entire genealogical community to raise its voice and speak out on behalf of the Library of Virginia. The budget fight on behalf of this premier research repository has hit the front burners in the Virginia General Assembly funding process, and The Legal Genealogist is joining the Virginia Genealogical Society and others in asking you to join in to try to win back funding lost in last year’s cuts. Only if we join together, only if we will all take the time to simply speak out, do we have a chance to help protect and preserve access to the records held by this facility. So… we are making some progress in the Virginia General Assembly budget process. Concerted efforts by VGS and the genealogical community — in other words, your letters and emails and calls and mine — have led the budget committees in both houses of the General Assembly to vote to restore some funding. 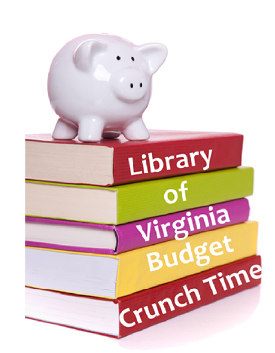 If that budget passes, library hours will be greatly improved and staffing will get a little better. And the House budget committee agreed that the staffing needed more: another $294,250 for four more key archivist positions. But the Senate committee didn’t go along. That proposal — to add back that $294,250 for those critical positions — will go to a budget conference committee this week. We need to let the budget conference folks know how important these positions are… and how much LVA means to us as genealogists and researchers. And when I say important… I mean really important. One of the positions we’re trying to get funded is for a private papers archivist to help accession and catalogue incoming private papers. Things like diaries and Bibles and wartime letters that continue to flow into LVA. Things like the surviving burial records from Evergreen Cemetery, an historic private African-American cemetery in Richmond. Crucial records. You know how many private papers archivists LVA has now? None. It used to have six. This money could give back one — just one — of these slots, and help fund another to work on getting historical records like pre-1912 birth and death records and pre-1936 marriage records ready to be digitized and put online. There’s a form letter you can download here (in Word format) or here (in PDF format) and list of legislators you can send it to that you can download here (in Word format) or here (in PDF format). And there’s an explanation of the positions you can download (in PDF format) here. If we use these materials to contact legislators, seriously, it won’t take even an hour of our time to speak out for records, for records access, for history, for the future of genealogy. Not even an hour of our time. And a lifetime of records could be protected and made accessible. DONE! And I phoned my own state delegate as well. Done. This is how I started my email: Please preserve Virginia’s history and make it accessible to researchers! I have ancestors in Dumphries at the time of the American Revolution and after and possiby before. I need the LVA for researching them. I have letters written by these people between 1805 and 1843 that will eventually need a home. I was considering the LVA but it doesn’t look good for the LVA given there is no private papers archivist. You could not have made it any easier for us. Thank you, from all of us. I believe I was just told nicely Senator Norment would only vote for what affects his district. He was the only reply so far. Thank you for your recent correspondence regarding important legislation that is being considered during the 2017 session. I appreciate you taking the time to share your input, as well as your advocacy on behalf of this important issue. Since the 2017 Virginia General Assembly began on January 11, 2017, my staff and I have been going through thousands of pieces of legislation to ensure that only bills which will have a positive impact on the Commonwealth earn the vote I cast on behalf of all constituents of the 3rd Senatorial District. No, he’s saying if it has a positive impact on Virginia (“the Commonwealth”), he’ll vote for it — and we can certainly make the case that what’s good for the Library of Virginia is good for Virginia. Thank you, Judy. I emphasized that while I’m not a resident of Virginia, I have family history there and am planning two research trips to Virginia this year. I know much information is available online, but I’ll be spending a substantial amount of money that goes into their local economy and need to make that investment worthwhile for me. Exactly the tone to take, Gayle, and thank you for speaking out. Thank you for speaking up for LVA! I live in Richmond and use the LOV all the time. Can’t let that wonderful resource deteriorate. I learned about this through Amy Johnson Crow. Being a Virginia resident, a former librarian, a genealogy enthusiast, and from a family which has donated a lot of material to the LVA, I am horrified. I called Steve Landes’ office and the receptionist asked if I had a particular bill in mind. I explained that this was a committee issue, not yet a specific bill. I’m not sure she took me seriously. There are specific amendments to the budget that address the LVA situation. They’re referenced in the suggested letter: budget amendments 240#1s and 240#1h to allow the Library to re-open 6 days per week and House budget amendment 239#1s for $294,250 for four key staff positions. Did anything happen in the Va governmental process about this as yet? I am catching up and as I have 2 family lines (at least)that were in Va (now W Va) I am also wanting to follow some advice you had here not long ago about making monetary donations to these historical societies and I hope to follow up with that this week. Thank you for all you do. Yes. See Records access alert: a win.